Three former Indian captains, Sunil Gavaskar, Ravi Shastri and Srinivas Venkataraghavan, will have the final say on the rift between captain Sourav Ganguly and coach Greg Chappell. The rumblings in Indian cricket today found an echo in the Australian and English media, which largely appeared to be on the side of coach Greg Chappell in his row with skipper Sourav Ganguly. Three cricket bodies from different parts of the country today approached the Supreme Court challenging the Calcutta High Court Division Bench order, refusing to approve appointment of two of three observers for the annual general meeting of Board of Control for Cricket in India elections last week. Leander Paes and Mahesh Bhupathi dented Swedish pride when they overcame Jonas Bjorkman and Simon Aspelin 3-6, 6-3, 6-4, 6-3 in the doubles to deny the visitors a clean sweep in the SAIL Davis Cup World Group playoff tie at the R.K. Khanna Stadium grasscourt here today. However, Sweden expectedly wrapped up the tie when Thomas Johansson easily disposed of Prakash Amritraj 6-4, 6-3, 6-2 in 121 minutes in the reverse singles to take an unbeatable 3-1 lead. Croatia and Slovakia, two of Europe’s younger nations, made history yesterday when they reached the Davis Cup final for the first time. An unexpected second-round loss to unheralded Melinda Czink at the Sunfeast Open in Kolkata saw Sania Mirza slip from a career-high 34th position to the 37th place in the latest WTA rankings released today. Fernando Alonso (24) of Spain, the youngest champion in Formula One history, commanded all the attention after finishing third in the Brazilian Grand Prix yesterday and taking the crown with two races to spare. Bishnoi Cricket Club, strengthened by the inclusion of southpaw Sri Ram, registered a 40-run win over Mumbai Cricket Association in the first quarterfinal of the JP Atray Cricket Tournament at DAV College, Sector 10, here today. Yadavindra Public School, Patiala, continued their impressive run in the team event of the IPSC Tennis Tournament being held at the Yadavindra Public School here today. Eastern Railway garnered 15 points to win the team championship title at the 18th All-India Railway Chess being held at the DMW here today. Southern Railway finished second with 13.5 points, while Western Railway were third with 13 points. The 53rd Northern Railway Athletics Championship began at the railway stadium near DRM complex today. In 10,000 m, (men), Puran Chand of Ambala stood first, Harish Patel of Lucknow was second and Sanjay Kumar of Ambala was third. Shivdeep Singh of Bathinda was declared overall best gymnast in the under-14 category, while Sangeeta of Patiala won the title in the girls category at the Punjab State School Games which concluded here today. Three former Indian captains, Sunil Gavaskar, Ravi Shastri and Srinivas Venkataraghavan, will have the final say on the rift between captain Sourav Ganguly and coach Greg Chappell. The Review Committee of the Board of Control for Cricket in India (BCCI), scheduled to meet in Mumbai tomorrow, will go by the decision taken by these three, according to sources in the Board. At least two of the former captains — Gavaskar and Shastri — were in Zimbabwe as commentators and may have enough first-hand knowledge of the entire episode to give a frank view of what happened there. The duo will be in a better position to see if Ganguly has a future in the team for the 2007 World Cup. Venkataraghavan, who has retired from the elite panel of ICC umpires, knows where international teams stand and can assess Ganguly’s performance both as batsman and captain in comparison with other teams. Speaking to The Tribune this morning, a senior functionary of the Board said the three BCCI members on the panel, BCCI President Ranbir Singh Mahendra, his predecessor Jagmohan Dalmiya and Secretary S.K. Nair, would probably not take sides in the Ganguly-Chappell feud but abide by the opinion of the three former Indian captains. These three Board functionaries probably know that at this point of time Indian cricket is in the dumps and Chappell must be given all help to raise it up to a respectable level. If Ganguly does not fit in this scheme of things then it would probably be better to dump him now and nip the division in the team in the bud rather than carrying on with him and seeing the team being ripped apart in the future. Harbhajan Singh’s statement to the media yesterday could well be the harbinger of similar statements from other members of the team. The polarisation of the team is apparent and the Board has already got into the act by warning players that they must not speak to the media. The warning, which came from the BCCI Secretary, might have cooled down tempers for some time but there is no guarantee that a statement similar to that of Harbhajan is not issued by some other member of the touring team. BCCI insiders, however, say that there is a lot of truth in what Chappell has to say about the Indian team in the e-mail sent to Mr Mahendra. But at the same time they admit, at least privately, that Ganguly’s contribution to Indian cricket cannot be overlooked. In this connection they point to the unstinted support that the beleaguered Indian captain got from the Board when he was handed out a six-match ban for slow over rate at the conclusion of the fourth one-day match against Pakistan at Kanpur earlier this year. However, certain persons close to the powers that be in Indian cricket are of the view that certain senior players, including Ganguly, do not fit into the scheme of things of the new coach, especially with the 2007 World Cup less than two years away (For the record, Chappell’s appointment is up to the World Cup). Whatever be his reason and whatever the support he has got from the Indian manager of the team touring Zimbabwe, Amitabh Chowdhary, there is no denying the fact that Ganguly looked a tired man right through the tour. He did score a century in the first Test against Zimbabwe, but it came against an attack which was barely up to the standard of a lower-order Ranji Trophy team, and even then he never looked like a man in full command. Even as the three former captains decide Ganguly’s fate, it may be recalled that Gavaskar and Shastri were also part of the Search Committee for the coach and their first preference was Mohinder Amarnath, for whom Gavaskar has great respect as a player. But eventually the committee had opted for Chappell. “Epic power struggle” and “Indian soap opera” were some of the phrases used to describe the unprecedented face-off between “the two most important figures in India’s dressing room”. “When a captain claims his coach asked him to step down, as it happened in Zimbabwe recently, there are bound to be repercussions. “It could have been settled privately, but it became a matter of public consumption when Ganguly went to the Indian press, who went to town on the disclosure,” it wrote. “Having this year become the coach of India — one of the most closely scrutinised jobs in world cricket — Chappell knew controversy would arise at some stage. He didn’t have to wait long,” it said. “He’s on his first tour, of Zimbabwe, and already he’s embroiled in a falling-out that will cost either the coach or the captain his job, the Sydney Morning Herald report said. The Guardian, treading a cautious path, said, “India’s captain has been depicted by his coach as a political manipulator out to preserve his own career in a leaked email to the Indian Board. The BBC said Ganguly enjoyed the backing of the most powerful man in subcontinental cricket, Jagmohan Dalmiya, the immensely well-connected former Board President. The Punjab Cricket Association(PCA) has fixed September 29 as the date for off-spinner Harbhajan Singh to explain his reported outbursts against coach Greg Chappell before the Administrative Committee of the association. When asked about Harbhajan’s confirmation regarding his appearance on the date, Mr Pandove said, “We will like him to come on that date”. The off-spinner has assured on the phone that he would present his side of the story very soon, added Mr Pandove. In his statement, Harbhajan had sided with skipper Sourav Ganguly and blamed Chappell for creating fear and insecurity among Indian cricketers. Harbhajan is registered with the PCA and presently part of the Indian team. Therefore, he has being advised to meet PCA office bearers for discussion and appropriate remedial measures. Three cricket bodies from different parts of the country today approached the Supreme Court challenging the Calcutta High Court Division Bench order, refusing to approve appointment of two of three observers for the annual general meeting (AGM) of Board of Control for Cricket in India (BCCI) elections last week. Rajasthan Cricket Association (RCA), Netaji Cricket Club of Chennai and Bihar Cricket Association made special mention of the matter before a Bench of Mr Justice Y.K. Sabharwal, Mr Justice S.H. Kapadia and Mr Justice C.K. Thakker, seeking immediate intervention of the apex court in the matter. The Bench gave liberty to the counsel of the three cricket bodies to file the petitions and make mention of the same tomorrow after the formality was completed. The BCCI is also expected to move the apex court. A Division Bench of the High Court had refused to approve the appointment of former judges M.M. Punchi and K.N. Singh as observers but did object to the third judge S.C. Sen. The RCA and Netaji Cricket Club counsel said the single judge’s order regarding appointment of Justice Sen be restored and the AGM be held under his supervision. Leander Paes and Mahesh Bhupathi dented Swedish pride when they overcame Jonas Bjorkman and Simon Aspelin 3-6, 6-3, 6-4, 6-3 in the doubles to deny the visitors a clean sweep in the SAIL Davis Cup World Group playoff tie at the R.K. Khanna Stadium grasscourt here today. However, Sweden expectedly wrapped up the tie when Thomas Johansson easily disposed of Prakash Amritraj 6-4, 6-3, 6-2 in 121 minutes in the reverse singles to take an unbeatable 3-1 lead. The second reverse singles was not played, though Leander had kept himself ready to take on Jonas Bjorkman if Prakash had pulled off an upset. Chief referee Wayne McKewen ordered the end of proceedings after Sweden took a decisive lead, as the tie had spilled over to the fourth day. Sweden had taken a 2-0 lead after victories by Bjorkman and Johansson over Prakash and Bopanna in the opening singles. Bopanna, who fell and injured his left ankle while playing against Johansson in their unfinished match yesterday, was ruled out as he had torn the tendon of his ankle joint, and would be out of action for a few weeks. Sweden, who are used to making mincemeat of India as in the four previous meetings, they had won 5-0 on three occasions and 4-1 once, found this tie rather tough, and blamed the tedious weather and poor court conditions as the prime reasons for their hard run. Non-playing captain Mats Wilander said Davis Cup was a great tradition with the Swedes, having won the title on seven occasions, and it was a great honour for his team to win this tie. Sweden move into the World Group, while India return to the Asia-Oceania Zone. 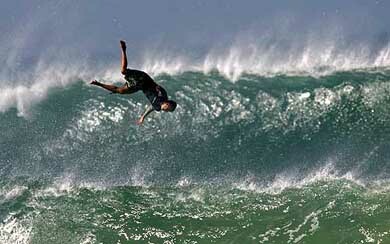 India’s attempts to get into the World Group since 2000 have met with failures. They figured in the elite company last in 1998. Leander and Mahesh took away some sheen from the Swedish win with their come-from-behind victory in the doubles. The only previous Davis Cup rubber win of India against Sweden was in the World Group quarterfinal in 1985, when Vijay Amritraj defeated Mats Wilander 8-6, 9-7 in a “dead match” after the Swedes had taken a 3-0 lead. The Indian pair, who were 3-1 up in the second set after losing the first when bad light stopped play last evening, maintained the momentum they had worked up when the tie resumed today. They played with perfect rhythm and understanding to upset the calculations of Bjorkman and Aspelin, as they got better and better as the match warmed up. Bhupathi served consistently and Leander chipped and charged at the net, and effected some classy returns to fox the Swedes. The Indian pair wrapped up the second set in 20 minutes this morning on Bhupathi’s serve after Bjorkman saved three break points to survive the eighth game. Though it was Bjorkman who was broken yesteday, Aspelin proved to be the weak link today. His weak serve and return were targeted by the Indians to go a break up in the opening game of the third set, and then played tight tennis to outwit the Swedes. In the fourth set, Bjorkman got a life when he saved two break points to hold serve in the third game, and Aspelin survived two break points in the fifth but could not hold out for long as Bjorkman was broken in the seventh. He served a double fault and erred again and again with Leander’s forehand winner fetching the game point. 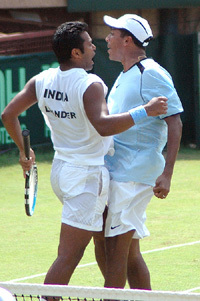 India went 5-3 up when Bhupathi held serve, and then broke Aspelin to win the game, set and match. In the reverse singles, Johansson, this year’s Wimbledon semifinalist, proved why he was ranked 14th in the world as he played a calm and collected game to quell the aggression of Prakash Amritraj, whose inexperience showed up. Prakash played a better all-round game, though he did not know how to tackle the precision serve of Johansson, who homed in 16 aces as against three by Prakash. Johansson’s serve made all the difference, though he was good at his returns, too, and covered the court well. He, however, termed the grass turf as the worst-ever surface he had played on. Prakash was broken in the seventh game of the first set, seventh and ninth games of the second and sixth and eighth games of the third when he gave away the game, set and tie with a double fault. The end could have been quicker had Prakash not survived two break points in the second game. He lost confidence after he slipped and fell on the court, requiring medical attention, though he suffered no serious injury. NEW DELHI: Mahesh Bhupathi, the ace doubles specialist, has slipped a rung down to 12th position in the newly released ATP individual doubles rankings. Sania finished the week with 880.75 ranking points, according to information received here. But Sania’s disappointment in the singles has been compensated by her all-time-high 129th ranking in the doubles, aided by her semifinal appearance in the Sunfeast Open partnering Virginia Ruano Pascual. Sania had clung to the 34th place even after a first-round exit from the Wismilak Open in Bali held before the Kolkata tournament but she ran out of luck and dropped three rungs. Among other Indians, US-based Shikha Uberoi made a quantam leap from 152nd to finish on the 139th position, largely due to her impressive show in the Kolkata tournament where she reached her first career quarterfinal only to lose to top seed and eventual winner Anastasia Myskina. Her appearance in the doubles final, in tandem with sister Neha in the same event, though, catapulted Shikha to her career-best ranking of 208th in double ranking. Shikha’s sister Neha, in contrast, slipped 12 places to be on the 263rd position in singles but reached her career-high doubles ranking of 188th. Another US-based Indian Sunitha Rao moved up one place to be on the 160th position. After parking his car, he stood and bellowed his satisfaction before blowing kisses to the crowd and disappearing into a crowd of cheering mechanics. Bishnoi Cricket Club (BCC), strengthened by the inclusion of southpaw Sri Ram, registered a 40-run win over Mumbai Cricket Association in the first quarterfinal of the JP Atray Cricket Tournament at DAV College, Sector 10, here today. Batting first, BCC scored 222 runs with the help of fine knocks by Ranji Trophy player Yashpal (71) and Sri Ram (63). The two were involved in a fourth-wicket partnership of 73 runs. All-rounder Joginder Sharma chipped in with a breezy 44 of 27 balls, hammering four boundaries and two sixes. Abhishek Nair (5 for 35) was the most successful bowler for Mumbai. In reply, Mumbai Cricket Association could muster only 182 runs for 9 wickets in 45 overs. Wilcom Mohta (37) and Usman Moulvi (36) were the main run getters for Mumbai. Chetan (3 for 18) and Ashish Malhotra (2 for 29) were the most successful bowlers for Bishnoi Cricket Club. For his brilliant batting performance, Yashpal was given the man of the match award. With this win, Bishnoi Cricket Club became the first team to reach the semifinals. Due to overnight moisture, the match started late and was reduced to 45 overs. In the second quarterfinal of the day, played at PCA Stadium, Mohali, Rajasthan edged out PCA Colts by 38 runs to enter the semifinals. Rajasthan, who were put in to bat first, received early jolts when they were reduced to 24 for 3 in 9.5 overs. Rohit Sharma, the opener for Rajasthan, made a scintillating ton in which he struck 12 boundaries and one six. 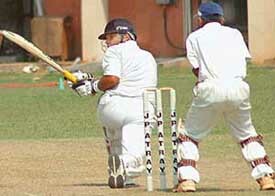 Former international Ajay Jadeja, skipper of Rajasthan, could not open his account as he was snapped up by the wicket keeper of medium pacer Love Ablish. Love took 4 for 40. He was ably supported by Karan Goel, who returned figures of 3 for 36. In reply, PCA Colts were bundled out for 179 in 44.2 overs. Only Amardeep Soankar (37) and Karan Goel (60) provided some resistance. Tomorrow’s fixtures: M.P. v Minerva Cricket Club at DAV, Sector 8 ( 9 am); All-India FCI v PCC at Sector 16 Stadium (9 am). In the team event, Karan Singh and Navinder combined well to stun Delhi Public School, Mathura road, New Delhi, 3-0 in the under-16 section. U-12: YPS Patiala b DPS Mathura Road, New Delhi 2-1 [Samman Verma (YPS) b Savar (DPS) 9-7; Karn (DPS) b Rishab (YPS) 9-1; Samman and Rishab(YPS) b Karan and Aadhar (DPS) 9-7]; Modern School, New Delhi b Welham Boys School, Dehra Dun 3-0 [Puroune (MOD) b Surendra (Welham) 9-2; Vishesh (MOD) b Jaskunwar(Welham) 9-1;Vishesh and Sahil (MOD) b Jaskunwar and Surendra (Welham) 9-0]. U-14: Modern School, New Delhi, b DPS Mathura Road, New Delhi 2-1 [Shantanu (MOD) b Rahul (DPS) 9-0; Ankit (DPS) b Sarvagya (MOD) 9-8 and 7-3; Shantanu and Nakul (MOD) b Vinayak and Rahil (DPS) 9-0]; YPS Patiala b Welham Boys School, Dehra Dun 3-0 [Arjun Sehgal (YPS) b Kunal (Welham) 9-0; Artim Gupta (YPS) b Praharsh (Welham) 9-0; Artim and Arjun (YPS) b Praharsh and Amanvir (Welham) 9-0]. U-18: Modern School, New Delhi b Welham Boys School, Dehra Dun 3-0 [Tanuj (MOD) bPrateek (Welham) 9-0;, Pulkit (MOD) b Karamveer (Velham) 9-0; Aadish and Tanuj (MOD) b Karan and Shaurya (Welham) 9-0]. Singles: U-12: Karan Bidani (DPS Mathura Road, New Delhi) b Vishesh (Modern) 8-2; Salil (YPS, Patiala) b Rishab Virdi (YPS, Patiala), 8-7 (7-4 tie breaker); Puroune (Welham Boys Dehra Dun) b Jaskunwar (Welham) 8-0; Samman Verma (YPS, Patiala) b Surendra (Welham) 8-1. U-14: Shantanu (Modern) b Aneet Singh (YPS, Patiala) 8-2; Rahil (DPS Mathura Road, New Delhi) b Sarvagya (Modern) 8-3; Artim Gupta (YPS, Patiala) b Ankit (DPS Mathura Road, New Delhi) 8-5; Arjun Sehgal (YPS Patiala) b Nakul (Modern) 8-1. Eastern Railway garnered 15 points to win the team championship title at the 18th All-India Railway Chess being held at the DMW here today. Southern Railway finished second with 13.5 points, while Western Railway were third with 13 points. Northern Railway and Metro Railway were fourth and fifth with 12.5 and 11.5 points, respectively. With the conclusion of the team competitions, individual matches will begin with defending champion B.Kamble out to annex the title again. Results: Team championship: round 5: Eastern Railway (3.5) drew ICF (0.5), Northern Railway (2.0) drew Western Railway (2.0), Southern Railway (3.0) drew South Central Railway (1), Metro Railway (3.0) drew Central Railway (1.0), Railway Board (2.0) drew West Central Railway (2), South East Railway (3.0) drew North Western Railway (1.0), CLW (4.0) drew RDSO (0), North Central Railway (3) drew DMW(1). The 53rd Northern Railway Athletics Championship began at the railway stadium near DRM complex today. In 10,000 m, (men), Puran Chand of Ambala stood first, Harish Patel of Lucknow was second and Sanjay Kumar of Ambala was third. In 10,000 m, (women), Sarabjeet Kaur of Ambala stood first, Pushpa Devi was second and Rajni Devi of Firozpore was third. In 20 km walk, (men), Rajesh of Ambala stood first, Ram Kumar of Moradabad was second and Klashim Raza of Moradabad was third. In 200 m, (women), Rupinder Kaur of Firozpore was first, Akvinder Kaur of Ambala was second, while Narinder Pal Kaur of Ambala was third. In 400 m hurdles, (men), Anney of Firozoure was first, Sat Pal of Ambala was second while Mukesh Lakra of Ambala was third. In 400 m, hurdles, (women), Baljit Kaur of Ambala stood first, Malkiat Kaur was second and Sarabjit Kaur of Ambala was third. In javelin throw, (women), Mukesh of Ambala was first, Laxmi of Lucknow was second and Jaswinder Kaur of Firozpore was third. In the under-17 category, Sandeep Kumar of Sports School was declared the best gymnast among the boys, while Sarbjit Kaur from Gurdaspur was declared the best gymnast among the girls. In the under-19 category, Sohan Lal of Sports School and Rohika from Gurdaspur were declared the best gymnast among boys and girls, respectively. In the rhythmic gymnastics Kirandeep from Patiala won the top honour at the games. In judo (under-14 boys) Jalandhar won the top position, followed by Amritsar and Gurdaspur. In the girls under-14 category, Amritsar won, followed by Jalandhar and Ludhiana at the second and third places, respectively. In the under-17 boys category, Jalandhar were the winner, followed by Amritsar and Gurdaspur. In the under-17 girls section, Patiala won the top position, followed by Jalandhar and Amritsar. In the under-19 boys section, Ludhiana won the top position, followed by Gurdaspur and Jalandhar. In the under-19 girls section, Amritsar won, followed by Ludhiana and Patiala. In under-14 gymnastics, Bathinda won the title, while Gurdaspur and Ludhiana were placed second and third. In girls under-14, Patiala won the title, followed by Jalandhar and Amritsar. In the under-17 Boys Judo Sports School Jalandhar won the top position while Patiala and Amritsar were placed second and third. In under-17 girls, Gurdaspur won the top slot, followed by Jalandhar and Amritsar. In under-19 boys, Sports School won the top position, followed by Jalandhar and Ludhiana. In under-19 girls, Gurdaspur won the title, followed by Jlanadhar and Ludhiana. Amritsar won the rhythmic gymnastics title, followed by Patiala and Jalandhar. In Wushu under-19 boys, Jalandhar bagged the first position, followed by Patiala and Amritsar. The Wushu girls event saw Jalandhar winning the top honours, followed by Ludhiana and Sangrur. The untimely death of P.M. Das, ADGP, during a mountaineering expedition in Sikkim has been condoled by various sports administrators. Mr M.P. Pandove, Secretary of the Punjab Cricket Association (PCA) and member of the Punjab Public Service Commission, said the PCA had today passed a resolution expressing sympathies with the bereaved family. Prominent among others who condoled the death were Director (Sports) Pargat Singh and former Director (Sports) Kartar Singh.